Scotland, UK: A customer are one of the worlds leading Power Plant Construction contractors. In 2007 they built 44 MWe Biomass Power Generation Plant on behalf of E.On UK plc. The site uses clean wood byproducts from an adjacent wood products processing plant and specially grown energy crop. The whole scheme provides energy using sustainable resources and is Carbon neutral. Veolia’s Mobile Water Services received a request from an engineering house to clean their steam lines prior to commissioning of the power plant using the process of Steam Blowing. The client was also using Air Cooled Condensers (ACC) which had become contaminated with debris during fabrication. The client also requested a closed loop filtration and polishing system for the ACC flushing in addition to temporary Deionisation for the steam blows. Using a mobile solution ensured minimum wastage of water and a significant reduction in cost. Steam Blowing: When commissioning power plants it is essential that the steam lines are free from particulate matter to avoid damage to the steam turbines. This is achieved by conducting “steam blows” – where steam generated in the boilers, is allowed to escape to atmosphere at high flow rates and velocities – blowing the particulate out of the steam lines. This loss of steam is usually beyond the capabilities of the installed de-ionising plant to make-up, so it is common practice to use mobile de-ionising units. Boiler Flush & Fill: The customer also uses air cooled condensers (ACC’s) which condense the steam exiting the steam turbines. Due to their delicate structure these needed to be flushed for 24 hours at a high flow rate. To minimise water and energy waste Veolia proposed a scheme of Skid Pumps and MOFI filters along with “standby units” to accommodate “swap-outs” as required which would have to be carried out without interrupting the flow through the system. Process Capacity: a continuous supply of 140m3 /h. Service Expertise: Created a closed-loop filtration approach and polishing system for ACC flushing. HSE: Maintained stringent Health & Safety standards under extreme operating conditions (5 bar, 85*c) as presented by the closed – loop approach. To Budget: Project finished within customer’s budget. 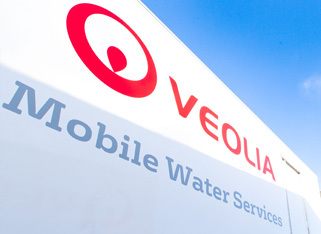 Thanks to the close cooperation between our customer and Veolia’s Mobile Water Services staff across Europe, careful consideration of the client’s needs and a diligently planned and executed project, our customer was able to successfully conduct the ACC flushing in a matter of just a few days. The novel approach developed by Veolia resulted in huge savings in time, cost and energy. Having now proven the technique on this project, our customer has been keen to adopt the procedure on a widespread basis and have with Veolia to standardise the process.